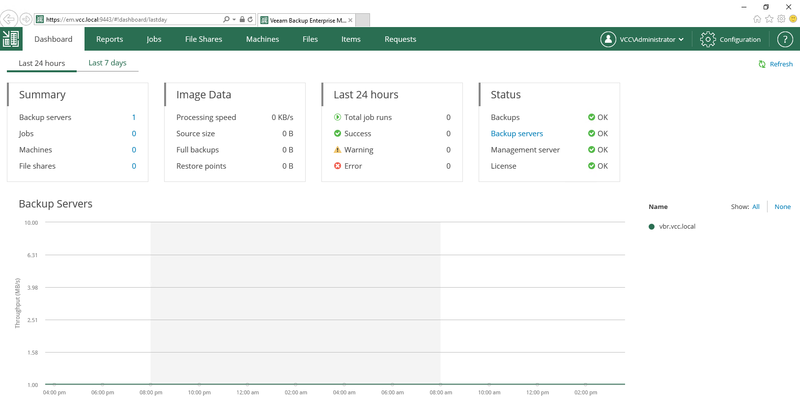 Veeam Enterprise Manager is the service responsible for exposing to users the web interface of Veeam Backup & Replication, and the endpoint for consuming Veeam RESTful API. In a Veeam Cloud Connect environment, the latter is an important component if the service provider plans to develop and offer to users a custom portal for managing their Veeam Cloud Connect subscriptions. Also, when Replication services are offered, The Failover Portal is a sub-site of the Enterprise Manager. Veeam Enterprise Manager is a Windows Service; Veeam requires a modern 64-bit OS, like Windows Server 2008 R2 and above. It can be deployed on the same machine as Veeam backup service or on a dedicated machine. The choice to create and operate a separated machine for Veeam Enterprise Manager involves scalability considerations: If many users are going to interact with Veeam Cloud Connect via RESTful API, a service provider should plan to have a dedicated machine. If a service provider chooses a dedicated machine for Enterprise Manager, it should also have a dedicated Microsoft SQL Server locally installed to manage data stored by Veeam Enterprise Manager itself; it&apos;s better to have Veeam Backup & Replication and Enterprise Manager have their own SQL servers, unless a common SQL Server Standard or Enterprise is chosen. Because of the light load created by Veeam Cloud Connect, the default SQL Express installation is fine to use. However, you should carefully evaluate the amount of expected data to decide which edition of Microsoft SQL Server (Express, Standard or Enterprise) is best suited for Veeam Enterprise Manager. By default, the installation wizard of Veeam Enterprise Manager uses LOCALSYSTEM as the service account to execute the service. As explained in the previous chapter, it&apos;s better to create and use a dedicated account to run the services. The service account is also used for the authentication in the locally installed SQL Server Express. For maximum security, you should enable only the HTTPS connections on the firewall and not the unprotected HTTP ones. 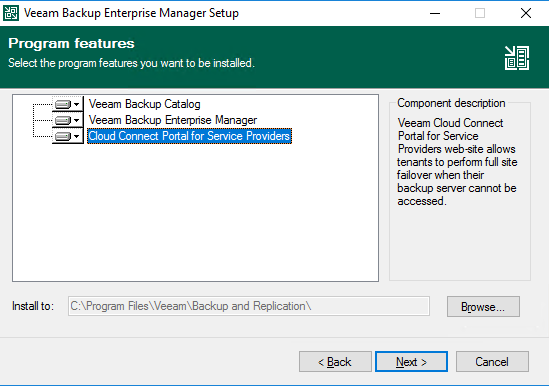 Veeam Cloud Connect will not need the catalog service because there is no local backup activity that stores file information in Veeam Enterprise Manager. In the table, you can see the suggested ports to open in bold. For any additional configuration of these two web sites, service providers can use IIS-native options. 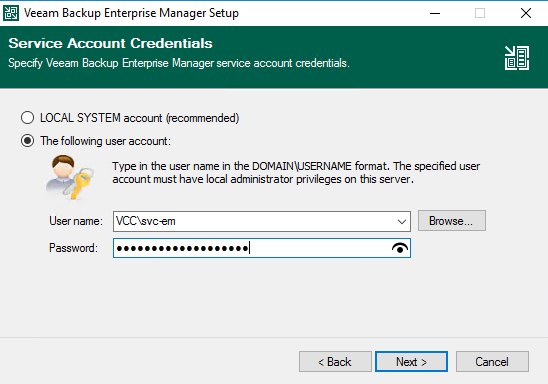 Veeam Enterprise Manager does not hold any Veeam Cloud Connect information, and only communicates to Veeam Backup Service. If anything happens to the latter, Veeam Enterprise Manager cannot operate. 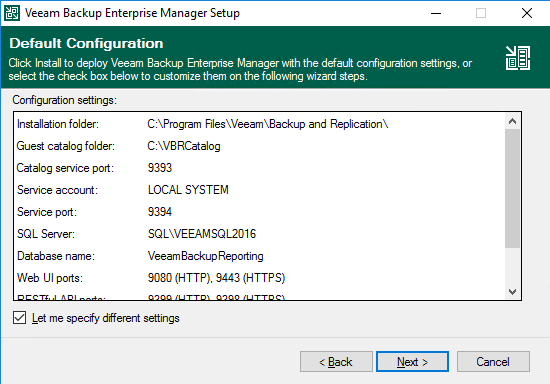 You should have Veeam Enterprise Manager running on a VM, protected with an image-level backup of the entire VM. What needs protection is the underlying SQL database, plus optional customization done to the websites.